Tonight is sadly the last night of Spring Break 2015. Tomorrow is back to the daily grind, the gym, the schedule, the work... so I will spend tonight reminiscing about my beach trip this week! 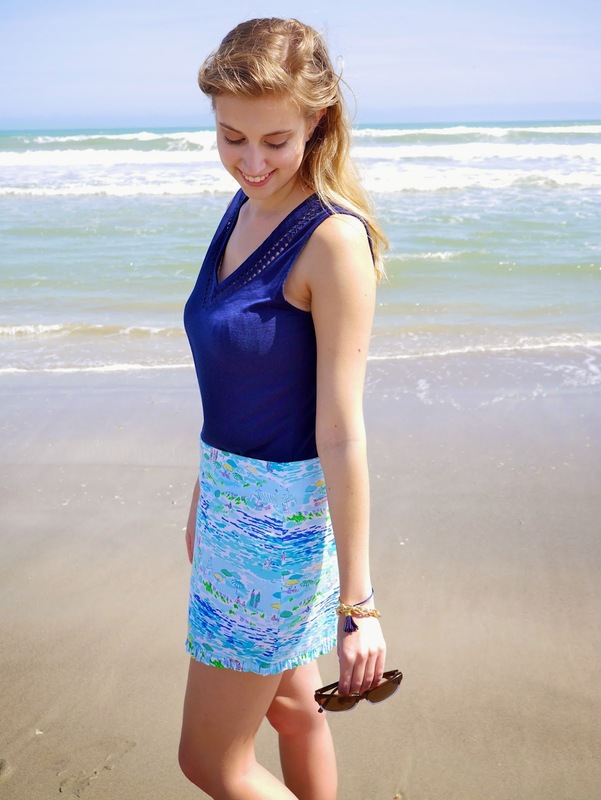 I love this Lilly Pulitzer skirt in High Tide Toile. It features people on the beach so what better place to wear than the beach!? See the little beach umbrellas and sun bathers on there? So cute! Okay story time: if you are a fellow fashion blogger then you know how it is to take pictures... awkward. Ha! Especially when you are on the beach and everyone is watching you! You go through the same poses pretty much every time. You are too cute! I usually look down, to the side, close up, necklace details, and full body.